Those were the post-game words of head coach Sheldon Keefe following his decision to call a timeout just over four minutes into a Saturday matinee win by the Toronto Marlies, who rallied from a very early 2-0 hole to win 7-4 over Wilkes-Barre/Scranton at the Coca-Cola Coliseum. Certainly, the Marlies‘ minds were elsewhere at the beginning of the game as they gifted the visiting Penguins a 2-0 lead. Kasimir Kaskisuo made a pair of excellent saves in the early seconds to deny Troy Josephs and Anthony Angello, but the goaltender was hung out to dry during four-on-four action. Casual play behind the Toronto net led to a turnover behind Kaskisuo and three Marlies players stood and watched as Jean-Sebastien Dea teed up Adam Johnson to open the scoring with 51 seconds on the clock. Andreas Borgman certainly wasn’t ready for the start of the game as he failed to react quickly enough after turning the puck over as the last man back. He failed to read the situation and didn’t track Angello, who skated past him, took a stretch pass from Josephs in stride, and beat Kaskisuo to put the road team up 2-0 just three minutes in. Thomas Di Pauli almost made it 3-0 a minute later, at which point Sheldon Keefe opted to take what turned out to be an inspired timeout. WBS took three minor penalties in just 80 seconds afterward in a remarkable passage of play that saw Toronto score three power-play goals. Chris Mueller tapped home a cross-crease feed from Jeremy Bracco during the first two-man advantage and Trevor Moore blasted a one-time shot past Anthony Peters on the second 5-on-3 to tie the score at 2-2. The third consecutive power-play goal was mainly due to some excellent puck recovery work from Josh Jooris on the left boards. His diving effort to dispossess Chris Summers and flick the puck behind him set Mason Marchment away. Pierre Engvall finished from the slot on Marchment’s pass to put the Marlies ahead 3-2 as Toronto scored for the third time in 91 seconds. After five goals in just over seven minutes, there was no further scoring in the first period, although Peters had to make a sharp pad save to rob Chris Mueller, who was allowed a lot of room as he cut to the net from the goal line. The Marlies played some of their best hockey of the season in the middle frame, although the box score numbers don’t necessarily back that up. The shots favoured the Penguins 9-7 in the second period, with the Marlies tallying the lone goal. Rasmus Sandin’ shot/slap pass was tipped by Mueller from the top of the hash marks and Bracco did an excellent job in altering his body position to allow the floating puck to hit him and drop into the net at the midway mark of the middle frame. The majority of the Pens shots were recorded in the final five minutes of the period, courtesy of two power plays and a giveaway. One huge shot block from Calle Rosen and an athletic save from Kaskisuo ensured the first penalty was killed, and the Marlies goaltender also denied Joseph Cramarossa after an error from Frank Corrado. The second power play for the Penguins carried over into the third period but only resulted in a goal for the Marlies just 16 seconds in. Calle Rosen’s smart play to shoot from a bad angle on the left side resulted in a huge rebound for Jooris to capitalize on flying down the opposite wing. It should have been consecutive short-handed goals for the Marlies, but the officials robbed Toronto’s debutant of a goal. Jooris created carnage around the net and teed up Morgan Klimchuk to score, but the officials decided to waive the goal off on account of goaltender interference despite Jooris clearly being shoved into Peters by a WBS defenseman. The reliable Colin Greening then struck the post on an odd-man rush with a backhand effort as the Marlies looked for a sixth goal that finally arrived at the seven-minute mark. A turnover by Patrick McGrath was pounced upon by Mueller, who turned provider for Bracco to score his second of the game from the heart of the slot. 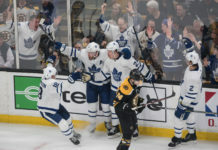 After scoring six without reply, the Marlies took their foot off the gas and were perhaps a little gassed on the backend due to the loss of Timothy Liljegren through injury. Ethan Prow struck on the power play for the Penguins, who proceeded to make it a two-goal game with six minutes remaining. Despite Dmytro Timashov clearly being hauled down, the officials allowed play to continue and Linus Olund scored on the rebound after Kaskisuo was unable to handle Stefan Elliot’s long-range shot. To the Penguins credit, they threw the kitchen sink at the Marlies late, pulling their goaltender and hemming Toronto in their own zone as they looked to close within one. The Marlies were able to withstand the pressure, however, and sealed the victory with some compensation for Klimchuk, who slotted the puck home into the vacant net. – A second straight win for the Marlies extends their points streak to five games. – A first professional four-point haul for Jeremy Bracco (2-2-4) included two primary assists on the power play and a pair of even strength goals. This was easily his best performance of the season to date and he got the rewards to show for it. – Chris Mueller registered his first four-point game for Toronto and is now ranked 15th in league scoring with 21 points in 18 games. – An assist for Calle Rosen — who recorded a team-high five shots — keeps him chugging along at a point per game pace (1-9-10) through his last 10. – A nice debut for Morgan Klimchuk on the fourth line. He was defensively responsible and he wasn’t afraid to engage physically alongside Colin Greening and Griffen Molino. It says something of his character and responsible game that Sheldon Keefe was willing to immediately hand him penalty-killing duties and use him to protect the lead late. – Timothy Liljegren was injured on a hit from behind in the first period. He attempted to return in the middle frame but was quickly pulled from action. – Kasimir Kaskisuo made just his second start since returning from injury, posting 36 saves for the victory. He had no chance with the first two goals and the third was a power play marker with traffic in front. Kaskisuo likely wanted the fourth goal back having not held onto the initial shot, but he made several key stops when the game was close despite arguably being less than 100% up to speed with the lack of game action.